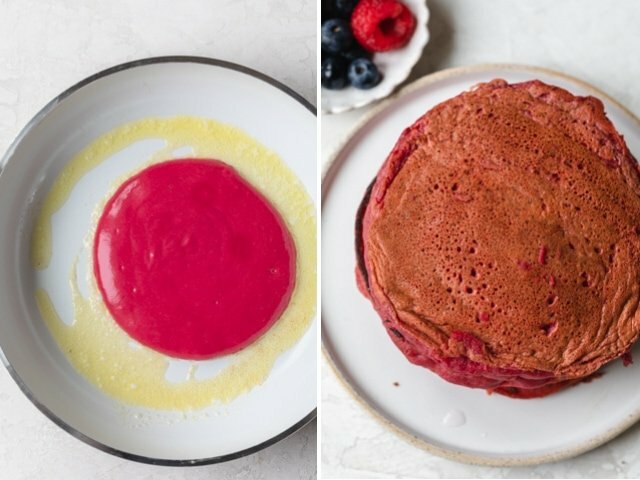 This Valentine's Day, make Pink Pancakes for your loved ones for breakfast/brunch. It's a super easy recipe made in a blender with beets for natural color! 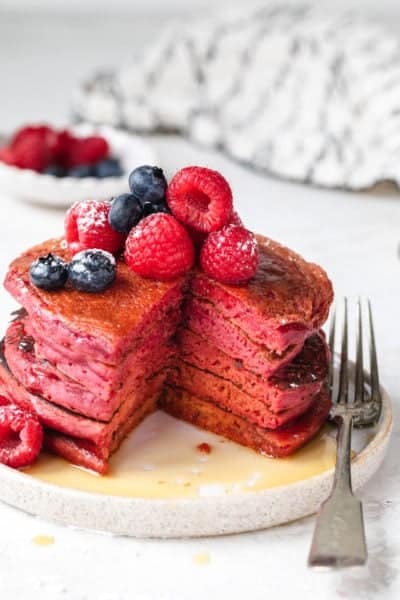 If you’re looking for cute Valentine’s Day ideas that involve food, try making my Pink Pancakes! I mean, does it even get any cuter than that? 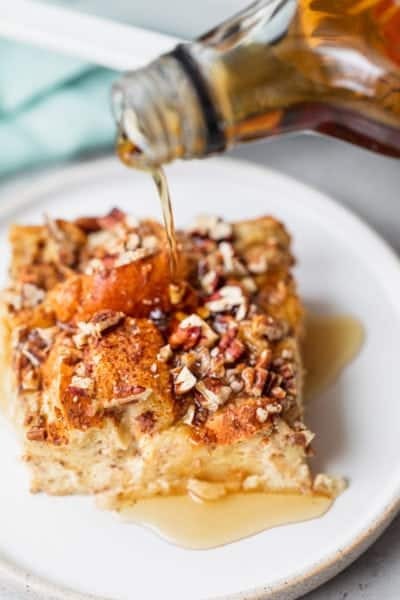 Whether you’ve got a significant other, little kiddos or you want something different to celebrate Galentine’s Day, this recipe will impress everyone. 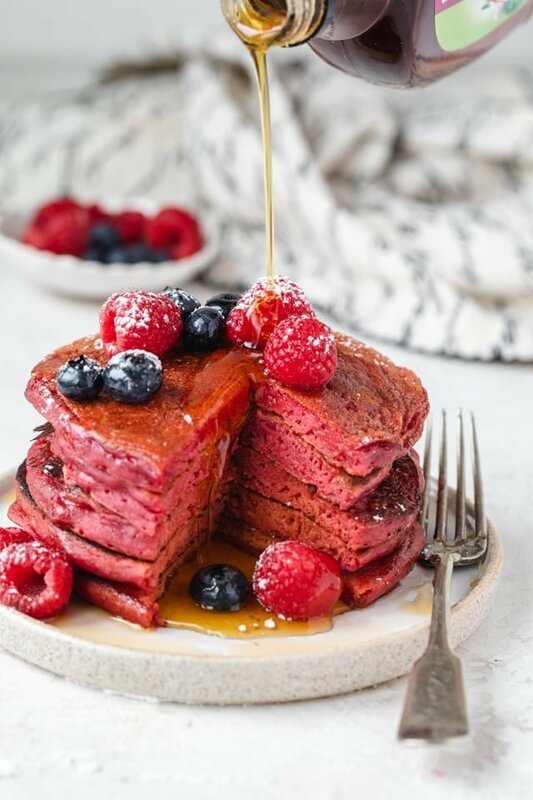 The best part is that it’s a simple pancake recipe made in a blender with the help of one beet for natural coloring! 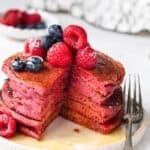 These beet pancakes are a great Valentine’s Day recipe that you can prepare the night before in a blender. Keep it in the blender covered in the fridge and then just fry them the pancakes the next morning when you’re ready. I love how the color comes out pink without using any artificial coloring! Start by boiling or roasting a beet. Both methods work fine and it just depends on your preference. There’s no actual taste difference between each method. If you’re in a time crunch, you can actually just peel the beet and puree it raw. But I recommend cooking it and peeling after it’s cooked. 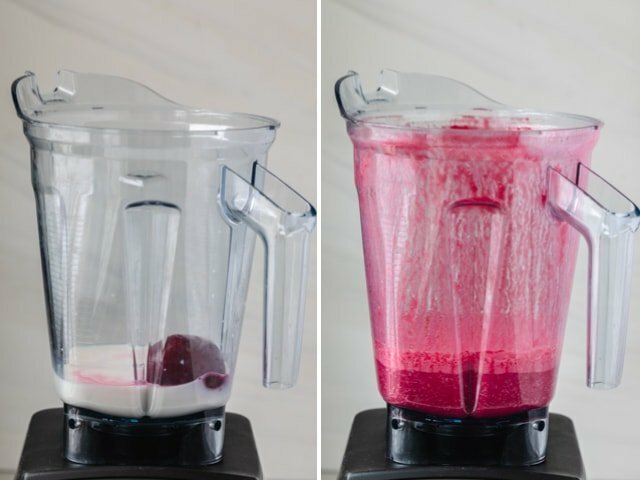 To get that pink color, blend the cooked beet with milk. Right away, you’ll see that you’re in [pink] business! Add on the other wet ingredients and blend again until it’s smooth and looks like a smoothie. Next add the dry ingredients. This time, pulse until you don’t see any flour streaks but the mixture is still lumpy. And that’s basically the batter for these pink pancakes. 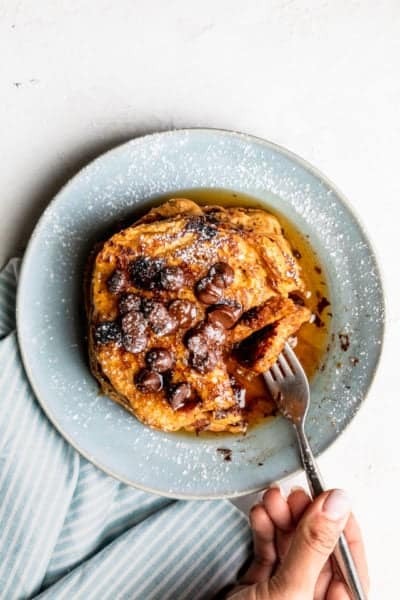 Now you can store it in the fridge until you’re ready to make the pancakes or heat a pan/griddle and get cooking right away. I usually prefer buttering my pan or spraying it with coconut oil. 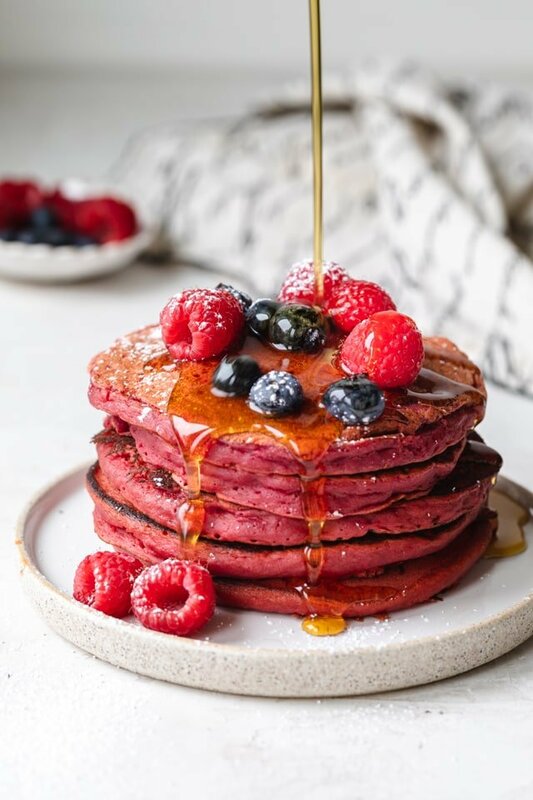 But in the case of these beet pancakes and my attempt at preserving their color, I would recommend not even greasing the pan. My husband, who is the official household pancake preparer, usually votes against ever using any oil or butter on the pan. And you’re probably wondering, what do they taste like? For me they really taste like normal pancakes. There is a very small hint of beet flavor but it’s very subtle. After all, there is only one cooked beet for 6 servings, and it’s mixed with the delicious pancake batter. Make sure the batter is lumpy. It’s tempting to make the batter perfectly smooth since we’re using a blender. But make sure to only pulse after you add the dry ingredients to keep it lumpy. If you overmix the batter, the pancake will turn out more dense and less fluffy. Use a cookie scoop or measuring cup. This helps to to make even uniform pancakes, but it also helps give the pancakes their perfectly round shape. Use medium heat for cooking. We want to slowly cook the pink pancakes without burning them. So this is the right temperature from beginning to end for this pancake recipe and any other pancake recipe actually. Flip when the bubbles form. Don’t check on the bottom for doneness. Look at the top for bubbles. This is the best signal that the pancakes are golden on the bottom and ready for flipping. If you’ve tried this healthy-ish feel good Pink Pancakes recipe or any other recipe on FeelGoodFoodie, then don’t forget to rate the recipe and leave me a comment below! I would love to hear about your experience making it. And if you snapped some shots of it, share it with me on Instagram so I can repost on my stories! 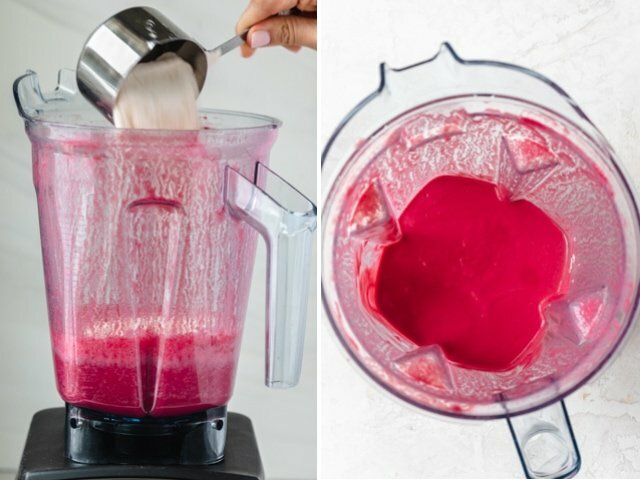 In a blender, puree beet with milk until smooth with no lumps. Add egg, butter, vanilla extract and maple syrup, and blend to combine. Add flour, baking powder and salt to the mixture. Pulse a few times to combine, being careful not to over blend. Heat a nonstick griddle over medium-low heat. You can melt butter on the surface or spray with cooking oil spray or leave it dry. Pour 1/3 cup of the batter into the hot griddle. 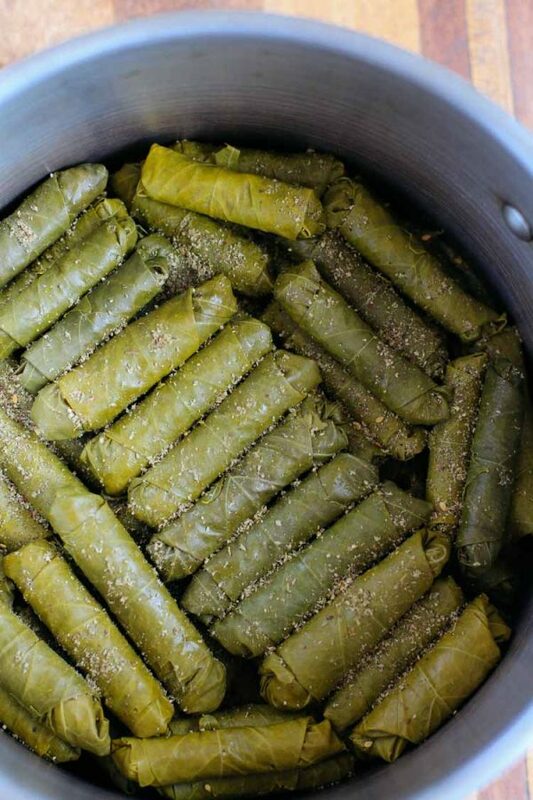 Cook for 2-3 minutes, until small bubbles start to form on the top and the edges firm up. Flip the pancake and cook for another 1-2 minutes until the pancake is cooked through. Repeat for the remaining batter. Serve immediately with mixed berries and maple syrup, if desired. 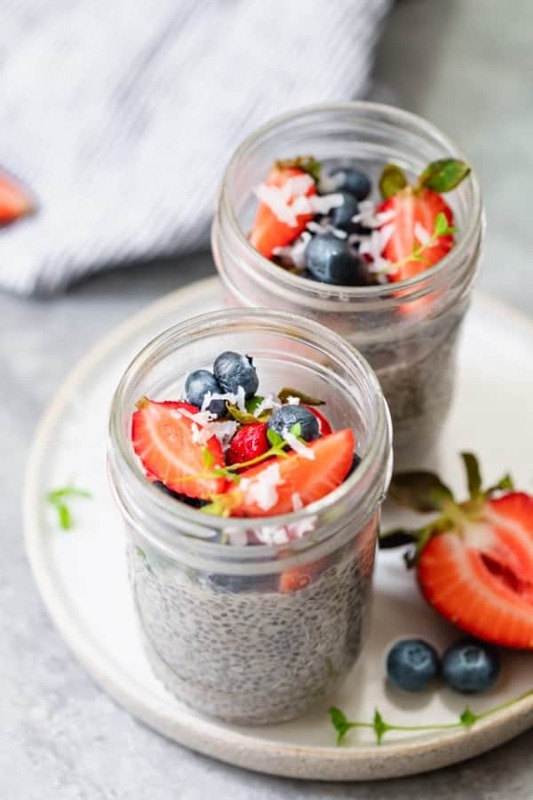 Make Ahead Tips: You can make the batter ahead of time in the blender and store it in the blender in the fridge overnight. 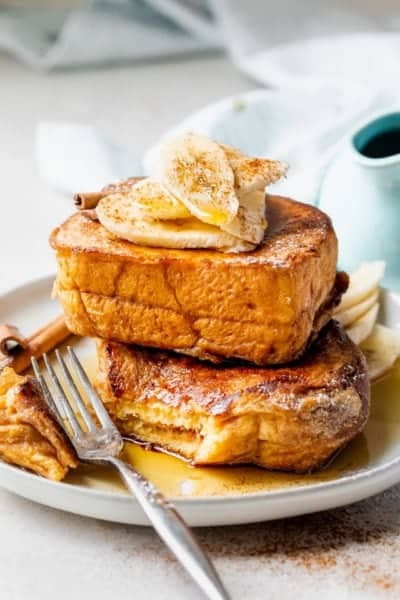 This makes for an easy breakfast the next day. To make it gluten-free, you can use gluten-free flour mixes labeled All Purpose. 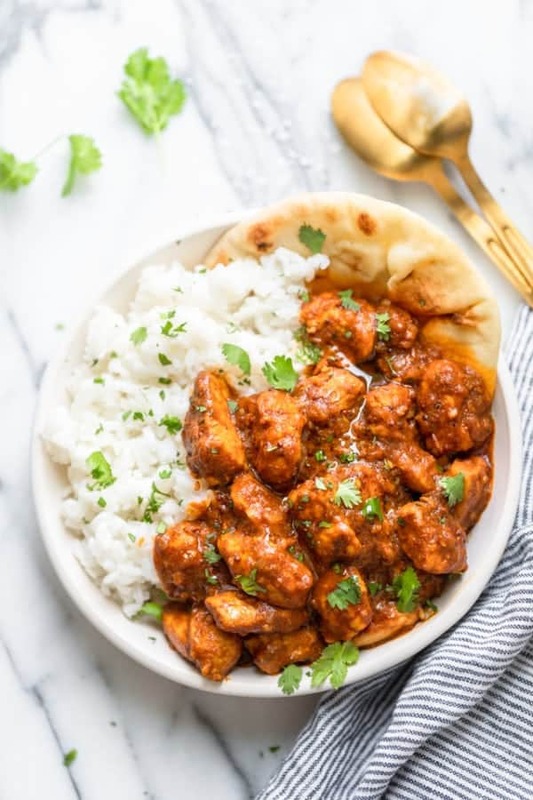 However substituting only almond flour, rice flour or coconut flour 1:1 will not work and may need some experimentation. 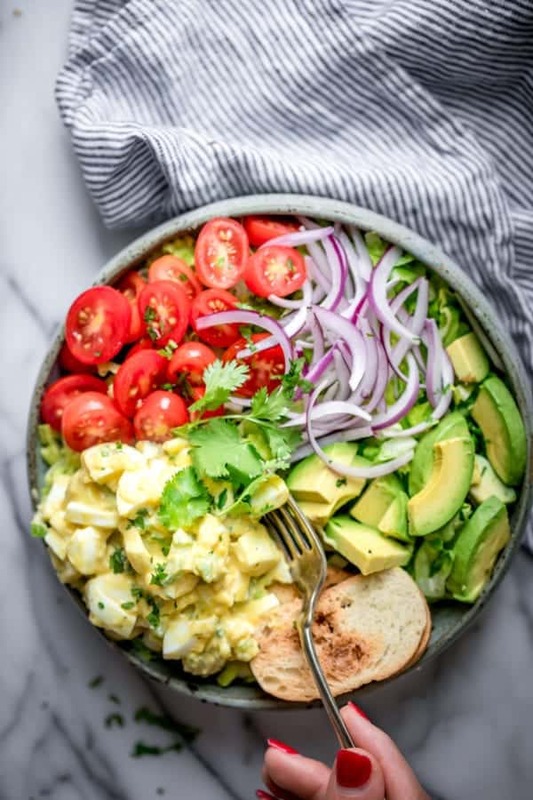 To make it vegan, you can leave out the egg completely, and substitute the butter for coconut oil. For a dairy-free option, you can use plant-based milk. Equipment: I make the pancake batter in my Vitamix. It has a "smoothie" button that works well for blending the wet ingredients. When I add the dry ingredients, I pulse to lightly combine. You can also use a food processor, but you definitely need some type of blender for incorporating the beet into the mix. Nutrition: Please note that the nutrition label provided is an estimate based on an online nutrition calculator. It will vary based on the specific ingredients you use. This information should not be considered a substitute for a professional nutritionist’s advice. The nutrition value is for one pancake without any toppings or maple syrup. Breakfast had a new vibrant look with the pink pancakes. Love it that You use beets for color. Super delicious. Absolutely easy to make, this recipe is sure to turn heads as they look divine. I made this for my husband and he loved it. The menthod itself is quite easy to follow. Pure genius I would say. 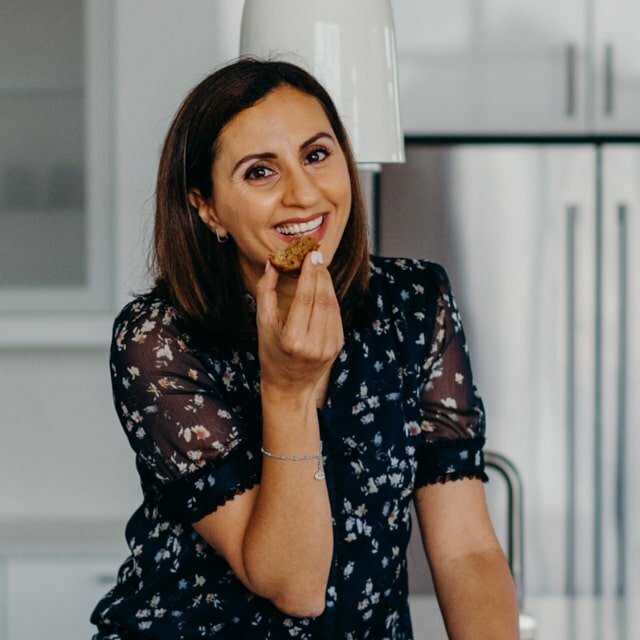 And the best part, it’s made of wheat flour which makes it super healthy.